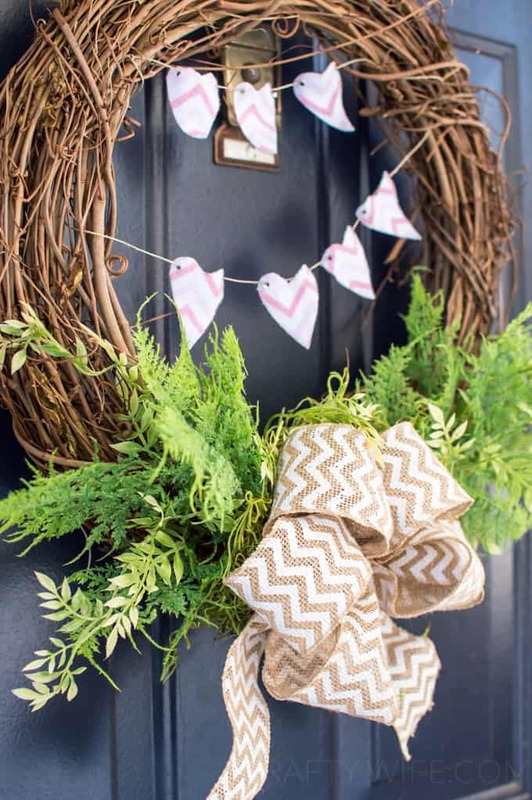 This Simple Grapevine Wreath is so pretty, and can easily be dressed up or down for each season so easily! My poor door has been looking a little bit scarce lately, and it’s because I just could not figure out what I wanted to hang on it! I actually bought something for Christmas but never got around to making it (oops!) so I have it put away for next year. When I was thinking of what I wanted for this season, I knew I had to have one thing: a style that could be used for multiple seasons. 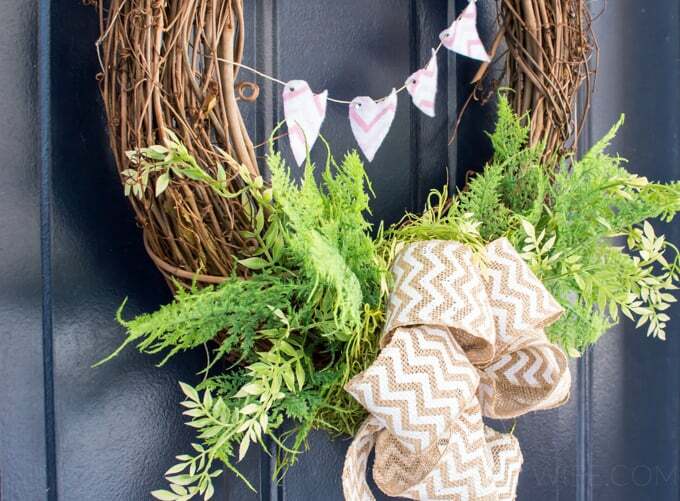 Because who has time to make a wreath from scratch every few months? Not me! With just a few tweaks I wanted to easily style it for Valentines Day, St. Patrick’s Day and more. 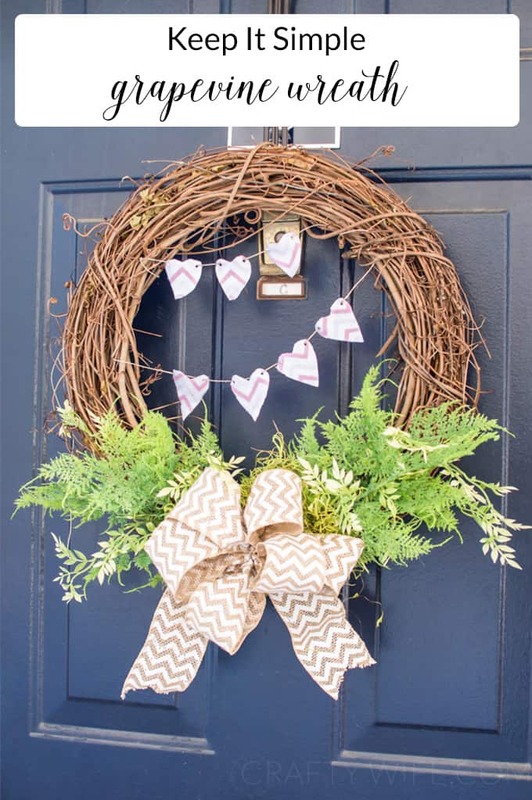 And one of my favorite ways to do that is with a grapevine wreath. I just love the simplicity of them! Now I know a lot of people think glitter is the herpes of crafting but let me tell you something. Around my house, that would actually be wreath bases. Those things multiply like flies around here, because I can never seem to find the exact base I want when making a wreath so I have to go out and buy a new one (shhh…don’t tell my husband!). For this particular project I wanted to use a grapevine wreath (my favorite kind! ), and I was excited because I knew I had one lying around the house. Trouble is, I couldn’t find it. So…I bought a new one. Ohhhh well. The other will turn up eventually! The idea behind this was to KISS it (keep it simple, stupid). I think it took me maybe 15 minutes to pull the entire thing together, and most of that was me cutting and stringing the hearts together. So easy and quick that I was able to pull it off while the little one took a nap. Now that’s my kind of project! For the greenery I used Spanish moss and different types of ferns to get the effect I wanted. I just kept stuffing the branches in to different parts of the wreath until it looked full enough to me. And then I hot glued the moss down so it wouldn’t go flying everywhere each time we opened and closed the door. To make the little hearts I used leftover fabric from this minky blanket project and then used a hole punch on the sides. Jute string is what’s holding that in place. You know what I love most about this project though? 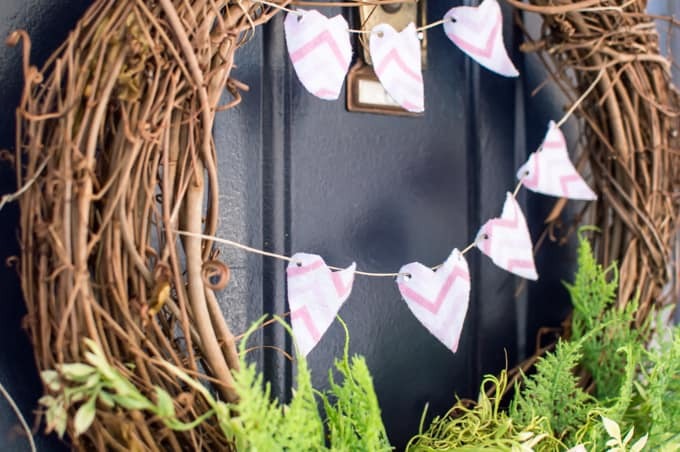 Those hearts are going to be so easy to take off and this wreath will be able to last me through Spring. That’s a crafting win in my book! So now I have a wreath that can be used for multiple occasions and I can rest easy knowing that my door will be making all the neighbors jealous. Actually, knowing that I put a wreath on my door will probably prompt my neighbors to do the same. I’ve started a trend here y’all. It’s pretty cool. What is your favorite project to do on a snowy (or rainy) day? I love how this wreath turned out! 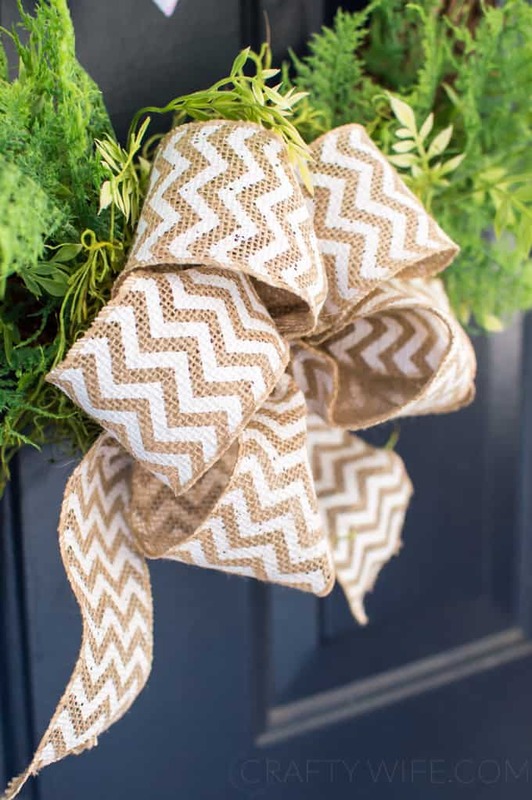 Now you’re making me want to make another wreath, like I need one haha! Thank you! I’m so happy with the way it came out! I love this. I am going to try it with my own little touches.